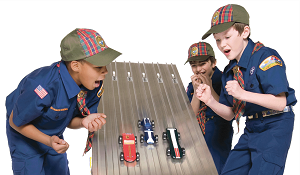 The Pinewood Derby is one of the most popular events in Cub Scouting. Every year more than 2 million boys and parents team up to carve, decorate, weigh, adjust, fret over, and finally race a Pinewood Derby car. The first Pinewood Derby was held in 1953 by Cub Scout Pack 280 of Manhattan Beach, California, and since then over 100 million Pinewood Derby model car kits have been sold. 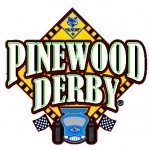 The purpose of the Pinewood Derby is to help the Cub Scout build a team relationship with their parent or helper, experience the sense of accomplishment and the excitement of competition, learn good sportsmanship, and to have fun. 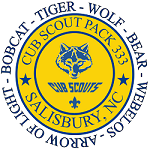 Open to all Cub Scouts, Tiger Scouts, parents and leaders. All cars must pass inspection to qualify for the race. Each car must pass inspection by the race officials before it will be allowed to compete. The officials have the right to disqualify those cars that do not meet specifications. Cars not passing inspection for minor infractions, i.e., weight, wheel width, loose body trim, will have an opportunity for re-inspection 10 minutes before close of registration. The race will be held indoors. This event is open to ALL Cub Scouts. District Winners will participate for FREE. You must race the car you raced at District Level.